We offer reliable office moving services for London and the neighbouring areas which will be performed by licensed professionals. Our company can guarantee a smooth moving of all of your possessions from your current office to another without problems and in a period of couple of hours. The specialists we will send you are very well-trained and will do their best to pack and move all of your things as fast as they can. For this service we will only ask you to pay a very affordable price at the headquarters of our company. Leave everything to us and our experts and you can be sure that we will do our best. Our professional company offers dependable office moving services to big and small companies from the entire city of London and in exchange for prices which are very low. If you are looking for a reliable agency with a lot of experience in the business, we can give you what you need. 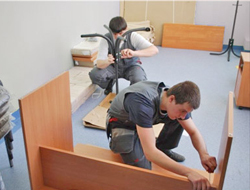 The specialists who work for us will take care of all of your possessions and will make sure that they are packed and transported without any problems to your new office or some other place. When you are switching work places or just moving into a new office somewhere in London or in another district of the capital, you can give us a call. Our professionals care about your opinion and therefore will consider your special requirement, if you have such. The different company vehicles which we have will transfer all of your things safely from one place to another, no matter how big is the distance or how many stuff you want to move. You can depend on our professional office moving services because they are the safest and fastest way to leave your old office or other real estate property and transfer into a new one. Our specialists will deal with the tedious packing and the moving and you won’t have to worry about anything. Contact us now in our main office in the city and book the excellent office moving services which we offer. You can choose the date and the time for the execution of the procedure.